I am always up for a fun way to decorate pumpkins without pulling out a carving knife. Not that carving a jack-o-lantern isn't fun, but with the warm weather here in Texas the carved pumpkins don't typically last very long. We save those for right before Halloween and the no carve pumpkins can come a little earlier and even hang out for the rest of Fall. These fun bakers twine pumpkins are a great way to add some fun colors to your Halloween and Fall decorations and thy are a great excuse for me to buy multiple colors of bakers twine. If you don't want to spend the money on different colors, you can always make your own bakers twine. 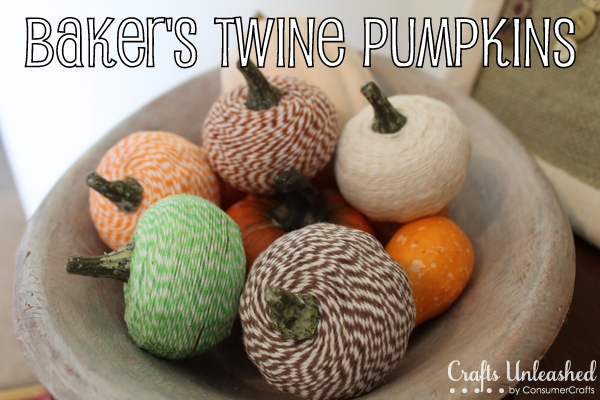 You can check out how to make baker's twine pumpkins over at Crafts Unleashed.